Some of the time I miss my mark on just how many bananas two people can eat before they get beyond that "just right" ripeness for eating out of hand. You know, when the fruit flies arrive. I have a good banana bread recipe for those times, but how many banana breads can you freeze, eat, or give away? Yikes! I guess you could say I have become bored with making banana bread. I have made a Banana Upside Down Cake, a Banana's Foster Cake, and a few other banana thingies, like cupcakes, muffins. My freezer is even complaining of too many frozen bananas lurking about. I have been blog searching for different recipes and this is the one I made today. 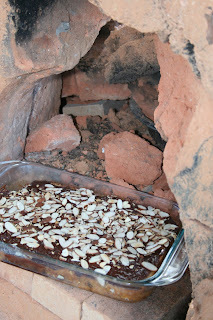 I took the lazy way out and used canned Chocolate frosting, toasted some sliced almonds and scattered them over the top. The cake was warm when I frosted it, making a glaze and I liked it. In a medium bowl, combine all-purpose flour, baking soda, baking powder and salt. Set aside. Stir in dry ingredients to wet ingredients until combined. Do not over stir. toothpick inserted into the middle of the cake comes out clean.